Alyssum is a delicate annual flower made up of clusters of tiny flowers in shades of white, pink, yellow, and purple, usually sold in six-packs in garden centers and department stores. It is hardy in every zone. Usually used as a ground cover, alyssum looks great as a border, around rocks, or as a filler in pots. Alyssum grows best in plenty of sun, at least 4 hours. Regular watering helps to protect it from the hot, afternoon sun. Alyssum prefers well-drained soil. Make sure pots have drainage holes because wet roots will lead to rot. One of the easiest annuals to grow, alyssum can be planted and just almost forgotten. Pruning dead sections will keep the plant blooming longer. It proliferates quickly and will re-seed itself, coming back on its own each year in most climates. This cascading flower starts to bloom immediately in spring, slows a bit in late summer, but turns a bit darker and vibrant in late summer into the fall, making it one of the most versatile plants available. Alyssum seeds are easily spread by wind. After planting one year, watch for signs of them popping up "wild" the next spring in your yard, cracks of sidewalks, or gravel driveways. Plant small, shallow flowers in your garden that are heavy on nectar and pollen. Herbs from the dill family, sweet alyssum and sunflowers should do the trick. These plants will help to increase the number of parasitic wasps that feed on the twiggall fly. Place a birdbath near your aspen. Put stones in the water so the wasps have a safe place to land and drink. The birdbath will also help in attracting birds that prey on the twiggall fly. Buy a bird feeder to place on your aspen. Fill the feeder with black-oil sunflower seeds or shelled peanuts. These attract chickadees, which feed on the the flies. Avoid over-watering or over-fertilizing your tree. Twiggall flies are attracted to succulent aspens. If you can manage to moderate your tree's growth, it is possible to reduce tree gall. Choose a location in full sun with well drained soil. Alyssum is also an excellent choice for containers, window boxes, and hanging baskets. Plant alyssum starts in beds several inches apart to allow for mature plant growth. If using as a ground cover, plant 6 inches apart with plants in staggered rows to maximize mature coverage. In containers, alyssum is happy to be crowded and will likely solve the space problem by trailing down over the side. Water transplants well and keep alyssum moist throughout the summer. Check containers and baskets frequently during hot weather to ensure adequate moisture. Water if the soil is dry to a depth of one inch. Fertilize with a diluted liquid plant food at half strength every two weeks. This is especially important for alyssum in containers because of the loss of nutrients from frequent watering and draining. Revive alyssum that has stopped flowering in the mid-summer heat by cutting back the spent bloom florets and watering consistently. New growth should return within a two-week time period. Cut back alyssum plants before winter and leave in the ground. 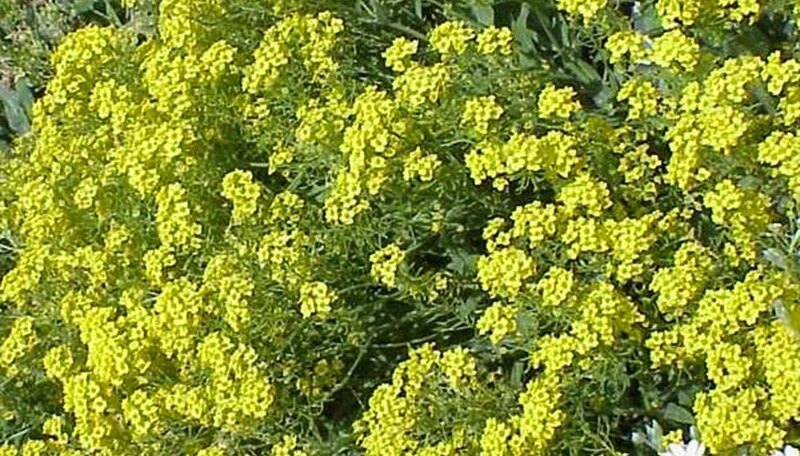 In USDA zones 3 to 9, alyssum may self-seed and return in the following spring. Choose a site for your alyssum plants. The flowers thrive best in partial sun and well-drained soil. Prepare the garden site. Use a spade or mechanical rototiller to loosen the soil to a depth of 10 inches, then add an inch of compost and mix it thoroughly into the dirt, according to Colorado State University. Fertilize the flower bed for enhanced alyssum seedling establishment. Clemson University recommends using an all-purpose 10-10-10 fertilizer, spread at the rate of 1/2 lb. for every 50 square feet of flower bed. Plant the alyssum seeds. Scatter them across the surface of the bare soil at a rate of two to three seeds per square inch. Don't bury the seeds, as alyssum requires sunlight to germinate, according to Michigan State University. Water the flower bed by misting the soil surface twice a day to keep the top inch moist. The alyssum seeds will typically germinate within 14 days. Wait until the winter frost and ground freezes are over before planting alyssum seeds. The soil should be 55 to 75 degrees F for the seeds to germinate. Plant alyssum in an area that gets either full sun exposure or shade for part of the day. Alyssum with thrive in either condition. It does not need any special soil preparation and thrives well in just about any soil type. Press the alyssum seeds into the soil, spacing them about 1/2 inch apart. Once the seeds are in place, sprinkle a little bit of soil over the seeds so that they are barely covered. Water the alyssum seeds gently, making sure that the seeds are not washed away by the water. To water them gently, sprinkle water over the seeds instead of pouring too much water at once. An indoor plant watering can will work well for gentle watering. Thin out the seedlings once they grow to about 2 inches tall. It will take about 2 to 3 weeks for the seeds to sprout. The seedlings should be thinned until the plants are about 6 inches apart. Add fertilizer about once a month to keep your alyssum blooming abundantly. A gentle fertilizer like fish emulsion or peat moss will keep it nourished and healthy. Water your alyssum each week if there is little to no rain. Alyssum is drought tolerant, but it will thrive better if it has water regularly.